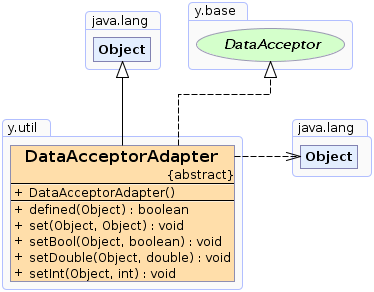 An abstract adapter class for accepting data. The data accepting methods in this class throw a UnsupportedOperationException and defined(Object) always returns false. This class exists as a convenience for creating data acceptor objects. Extend this class to access either typed or untyped data for a certain lookup domain. Returns false for all data holders. Subclasses may override this method to set object values associated with a data holder. Subclasses may override this method to set boolean values associated with a data holder. Subclasses may override this method to set double values associated with a data holder. Subclasses may override this method to set integer values associated with a data holder. Returns false for all data holders. Subclasses should override this method to make clear for which data holders there is a value accessible via this data provider.